25,500 square foot FEMA rated community shelter with primary usage as a school performing arts center. The building shell has a 184ft x 144ft low profile ellipse with a height of 30ft. The building has a 15,000sf footprint with a 2,500sf mezzanine. The building has the biggest single expression of Dome Technology’s values and is outstanding in its environmental commitment to tackling climate change. School is composed of two 91 foot diameter domes with connecting buildings. Fire station for spaceport base. 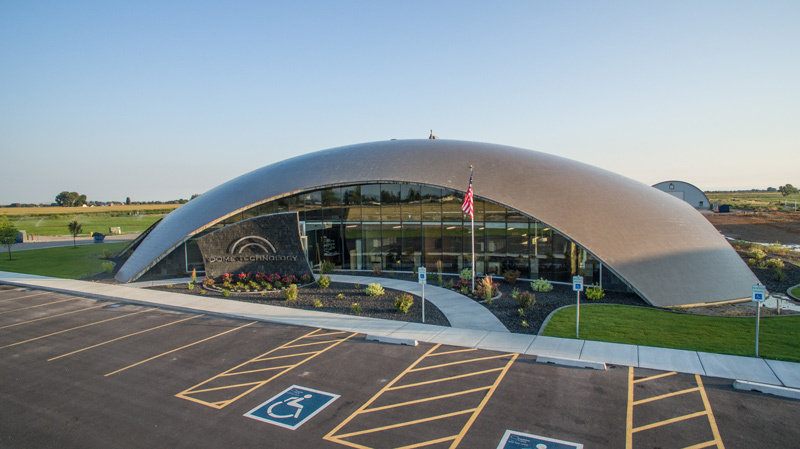 Building constructed using 193 foot diameter dome with large openings. La Haye Student Center at Liberty University, Lynchburg VA. Two concrete domes constructed on top of steel framing. Project had substantial savings using concrete domes in place of steel framed domes that were originally proposed. 17,000 square foot FEMA shelter with primary use as a school gymnasium.